Happy Holidays From the Deschutes River Alliance! We would like to take this opportunity to wish all of you a warm and happy holidays and a fantastic new year. We’re especially thankful this holiday season for the continued support and engagement of all our donors and supporters. 2017 is shaping up to be an important and exciting year in our efforts to restore cooler, cleaner water to the Deschutes River, and we could not be successful without you. So here’s to all of you and to another great year! As a reminder, the DRA’s first-ever auction and social gathering will be taking place on Saturday afternoon, February 11, at the Ecotrust Building in Northwest Portland. Tickets are going VERY fast for this event, so be sure to register soon to reserve a seat for this great event with other DRA supporters. The event will feature a live auction of 15 unique items assembled just for this event, with auctioneering duties performed by the DRA’s own flamboyant and entertaining John Hazel, co-owner of the Deschutes Angler Fly Shop. A day of insect identification and fly pattern selection with Rick Hafele and Mark Bachmann on the Salmon River near Welches. Rick literally wrote the book on western river insect identification, and Mark has been fishing the Salmon and matching the hatch for 50 years. The event will take place on river frontage at a private residence, and will include seining the river and a side channel, identifying the bugs and pattern matching, and a delicious barbecue lunch plus beer and wine. There are 12 available slots for the day, each of which will be auctioned off individually at $150 per spot. Two guides and two boats for four anglers on various Oregon steelhead rivers. More details to come before the event. Four anglers, two days on the Deschutes River during the stonefly hatch. Your fishing partners and “consultants” will be noted authors, speakers, and angling gurus Dave Hughes and Rick Hafele. Overnight stay in a prviate house at North Junction and a gourmet dinner. More details to come. A small raffle of high quality fly fishing items will also be held. This is just a small sample of the fantastic items that will be up for auction. Watch the DRA website and check your email for updates on other auction items! Remember, seating is limited to 150 and is going very fast. Can’t attend but want to help? Click here to donate to support the DRA’s ongoing efforts. Deschutes River Alliance: Cooler, cleaner H2O for the lower Deschutes River. 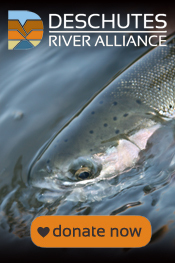 Click here to sign up for the Deschutes River Alliance email newsletter. Announcing the DRA’s First-Ever Gathering! Join other DRA supporters and lovers of the Deschutes River for an afternoon of fun, food, drink, and more on Saturday afternoon, February 11, 2017. This is the DRA’s first-ever gathering–an opportunity to visit with friends and other concerned individuals who, like you, have stepped up to help restore the health of the lower Deschutes River. Seating is limited to the first 150 to register, so act today! Tickets are just $75 per person, with all proceeds going to the DRA’s efforts to restore the lower Deschutes River, including our efforts to enforce the Clean Water Act at the Pelton Round Butte Hydroelectric Project. A premiere of the DRA’s new documentary film, which highlights the issues facing the lower Deschutes and the DRA’s efforts to restore the river we all love. A short live auction with 12-15 high quality items, including incredible fishing trips and unique fishing gear custom-made for the event. Complimentary wine provided by Lange Winery, and beer provided by Freebridge Brewing of The Dalles and other Columbia Gorge breweries. Bring some friends. Have some fun while supporting the DRA and our important work advocating for the health of the Deschutes River. Remember, seating is limited to 150. So click here to register now! Can’t attend but want to help? Click here to support the DRA’s ongoing efforts. It is with great pleasure that we share with you our 2016 Annual Donor Update. As you will read in the update, 2016 has been a big year for the DRA. We’ve continued our important scientific work in the lower Deschutes River and Lake Billy Chinook, and are now using the data we’ve gathered to create detailed reports on the sources and extent of the changes we’ve all witnessed in the lower river. Further, this research has provided a strong foundation for our increased advocacy efforts on behalf of all who treasure a healthy Deschutes River. This includes our lawsuit to enforce water quality requirements at the the Pelton-Round Butte Hydroelectric Complex. As always, none of this work would be happening without the support of our many donors: the individuals, corporations, foundations, and fellow environmental organizations that make it possible for the DRA to accomplish our mission. We’re sincerely grateful for all your support, and are excited to share our many accomplishments with you, along with our big plans for 2017 and beyond. With your support, we will restore cooler, cleaner water to the lower Deschutes River. Click here to read about the incredible momentum we’ve gathered over the past year, and how we plan to keep it going in 2017. And if you would like to make donation towards our programs in 2017, please click here. Wishing you all the best this holiday season. Here’s to another great year in 2017! Lower Deschutes River. Photo by Brian O’Keefe. The Deschutes River Alliance is a non-profit conservation organization founded by individuals, organizations and businesses who are passionate about the lower Deschutes River and whose driving desire is to do everything necessary to protect and enhance the ecosystem functions that support the lower Deschutes River’s unique and remarkable environment.